→ Give the Gift of Spanish Kids Music! Give the Gift of Spanish Kids Music! I love to give educational gifts of enduring value. My favorite gifts for children are music CDs and quality books. 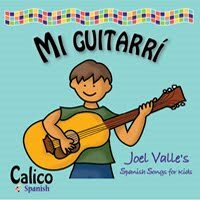 This year, you can give the gift of music, education, language development and fun with the Mi guitarrí: Spanish Songs for Kids CD. The lyrics are found within the full color liner notes and all the songs are 100% Spanish. Order your physical copy today from our own secure website at www.Miguitarrí.com. Visit our website: www.CalicoSpanish.com to learn more about our terrific Spanish products for kids!